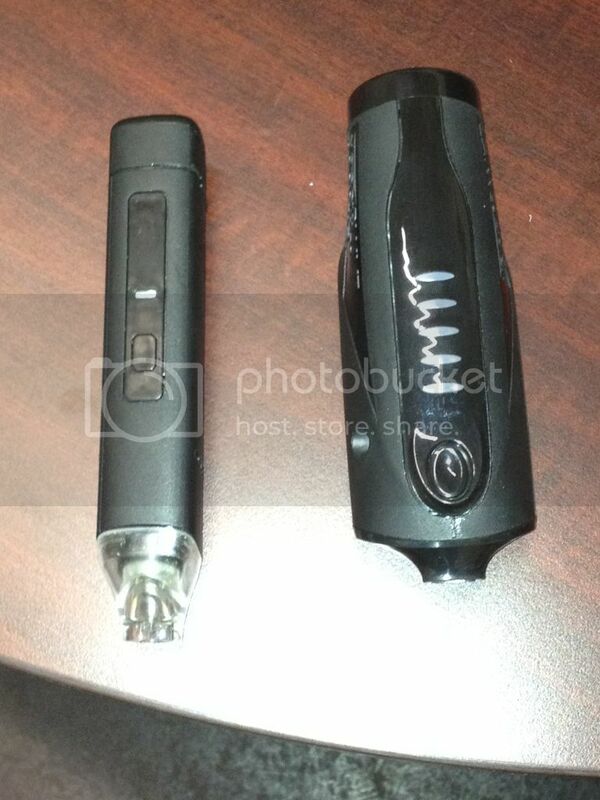 Discussion in 'Portable Vaporizers' started by TherealVaporblunt, Jan 22, 2013. The future of portable vaporizing technology continues to evolve in the secret Vaporblunt labs. Our newest addition to the market is the Pinnacle, a portable LI-ION powered device that is beautiful in its simplicity and efficiency. The Pinnacle employes the same one button easy on/off as the OG VB, however that is where the similarities stop. Measuring in at a very sleek and pocket friendly 5" long and 1" diameter, The Pinnacle easily fits in pockets (even those guys still wearing girls jeans) and gym bags. Please do not let the stealthiness of The Pinnacle fool you, this thing packs a punch wether you choose to use traditionally or with the equally stealthy 14mm compatible Micro Water Tool measuring a dainty 4.5" long with a 25mm diameter. The Pinnacle will be sold by itself or in a deluxe package including the water tool. Pricing is subject to change, but most likely the basic version will retail for $219, the DLX will add approx $150. Included as always is our 24 hour direct customer service, you will never be greeted by an annoying automated option menu when you call us. The pinnacle will also come with a cleaning brush, both a flavored and unflavored tip, and two "Bullets". A Bullet is a removable bowl that resembles a spent 9mm shell casing with a screen on the bottom. Once loaded with your favorite vaporizing blend, it is inserted into the chamber under the removable mouthpiece (the clear part is the mouthpiece). The Pinnacle features two heat settings. It takes roughly 50-70 seconds to heat up to heat setting 1, with an additional 20 seconds to reach level 2. Once the bullet it loaded it takes roughly 15 seconds for the convection vapor to be produced. The heating element rests under the bullet, and with the help of your lungs the 370 degree air (385 on lvl 2) is pulled through the Bullet to produce a vapor that is as pure of a taste that I have ever experienced. Whatever flavor of the blend you load in bullet, you will taste that flavor unaltered. This was a major design goal, I wanted to be able to taste the differences between my blends and I did not want to taste anything else. I feel our team did an excellent job of achieving this goal, as we achieved a taste I have only experienced in plug in Vaporizers such as Volcano and Vape Xhale Cloud. As for vapor path, there basically isn't one (think Inhalator vapor path). The bullet loads screen down and the mouthpiece acts as the vapor path as you pull the heated air through the bullet. This created a difficult engineering obstacle for my team, as they had to overcome my constant complaint of the vapor being too hot, however they blew my expectations away. The heat works almost works as an indicator of when to stop pulling on the device, think of it as a shot clock. When you feel excess heat in your mouth the device is telling to to exhale, and you will blow a tasty large cloud every time. We are not including any kind of extension tube, we have painstakingly engineered this device to work as is without the need of pesky extensions. Cleaning is as simple as cleaning the Bullet and the Mouthpiece. Once in a while you will want to swab out the area underneath the bullet as particles will ineffably work their way in there, but I haven't cleaned mine yet and I've spent at least 40 Bullets in it. Basically, this takes seconds to clean and has no part that become clogged. This is a very important feature in order to guarantee the taste stays pure, no matter if The Pinnacle has been used 1 time or 100 times. t-dub, rufus, nopartofme and 7 others like this. 1st proto, production units coming in March. This bad boy heats up in 45 seconds, and has two temperatures of 355 & 380 degrees. The downside of this vs the 2.0 is that it does flowers only, and lacks the power of the VB2.0. Battery life is approximately 40 minutes. These details could all change. Hey! It shrunk! Cool. Be fun to see 'under the hood'. Looks like every new version is no baby step forward.....well maybe Paul Bunyon as a baby? Looks a little thinner too? Could be very good for those of us with pockets that need filling.....in a discrete way of course. The new addition looks promising. Cool. Thinner is good. The mouthpiece and reduced button/LED array seem logical. Thanks for the look ahead. Looks like a step forward all right. Thanks for giving us a taste of what's to come, looks awesome ! Your right it can but this device is so simple I don't think it can be overhyped. Eh, we've seen lots of "the next greatest thing since sliced bread"
justcametomind and Mynameismud like this. I'm going to start a thread soon. We decided to presell to LHS at the vegas show in 2 weeks. I have been using this thing for the last few days exclusively, and the thing that most stands out is the taste. The taste is so pure I couldnt explain it well enough to do justice. I didnt mean to derail my own thread, so I'm rushing to get a new thread up as soon as I have details. I'll have it up by next Friday. Hi TRVB, i'm very interested in the mini vb. Tha battery will be removable? And when you say "production units coming in March", does this meaning that we can buy this vape in ..... March ? Hey TRVB, When the Pinnacle comes out, I'd love to see some review units make their way to people who own a Pax or an Inhalater. It looks like it has the potential to match the portability and performance qualities of those vapes, with a less finicky design. I'd love to see how it compares in practice. I agree with the inhalater comparison however, the pax i believe to be in another category. If you followed the vb2.0 thread it was called a "Swiss army pax" by some and that's really what it is. What's the range price for this? Being a sucker for portable gadgets, including portable vapes, this looks like a very cool unit. It looks like a great portable for when you only need a session or 2. I have to ask though, will i be able to charge this with USB? This would be very handy since i always carry this http://amzn.to/11BqU41 with me on the go! And like b0 asked, i am interested in the estimated price for this unit. Edit: Oh..And i would love a "cap" for over the mouthpiece. 1_gr8_underdog, elevation and Tweek like this. It's a disease, I tell ya. ataxian, Crohnie, 1_gr8_underdog and 3 others like this. as cool as the ascent is, i'm still also really looking forward to this pinnacle, looks like it's definitely more compact. hope we hear more soon.